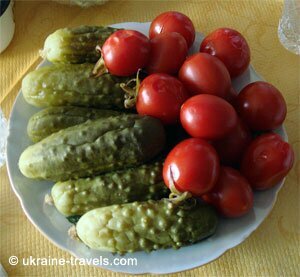 The Ukrainian cuisine is rich in carbohydrates, a little hyper-caloric and very tasty. 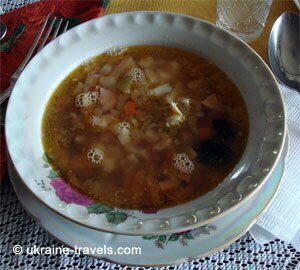 In the small photo on the left is a very good soup made with vegetables and chicken called Solianka, a traditional dish. The dishes are flavoursome, and you can say very colourful, made with an abundant use of animal and vegetable fats. All of this comes from an old tradition hundreds of years old where all was valuable for survival and to maintain strength for work and the daily hard life. In the course of time recipes have been improved minutely to yield this food, in spite of a lot of poverty, to be savoury and appetizing. 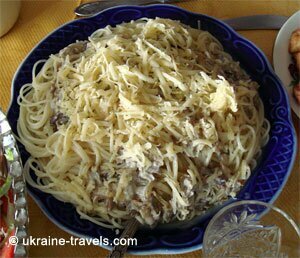 To describe this cuisine and typical dishes we use the little stratagem to write the title of the dish, how it would be pronounced in English and perhaps next to it the Ukrainian name in Latin characters in brackets. You may have noted already that we use this method to describe other things of everyday life typically using the currency that on this website is called grivnia but in reality the Latin characters must be written as Hryvna (UHA) but that would be difficult for our visitors to understand. 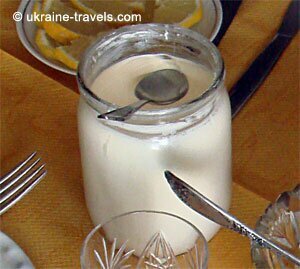 Returning to Ukrainian cuisine, that which is used the most is sour cream or that is, the skimming of milk with a particular working process. This product is used for everything both for savoury food and sweet food, from condiments for ravioli filled with meat or vegetables to tradition soup or borsc. In the small photo a jar of farm produced sour cream and I can assure you that, like Italy, farm products are tastier and certainly more genuine. Other well used products in the dairy sector are butter slightly more salty to ours, cheese which doesn't have a lot of taste and ricotta that is very good with a diverse taste, less sweet to Italian and less creamy, more consistent. Many Ukrainian citizens cultivate on small plots of land, these are their Dacia and from these they are able to supply the necessities for winter. A note on salt. Salt granules do not exist but fine salt does, as in condiment it is half between granule and fine, is less refined and very salty. Sausages are good but quite fatty and a little spicy, the odour of Italian mortadella has nothing to that seen with Ukrainian mortadella in spite of which you can eat it with gusto. A favourable note is lard. Ukrainian lard is really good, melts in the mouth and one slice is never enough. 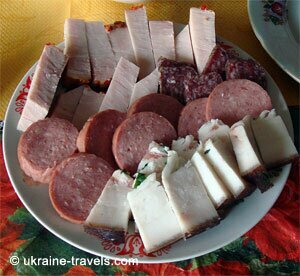 In the small photo on the right some Ukrainian sausages and lard. Many Ukrainian dishes are prepared in stews (sauces certainly different tot Italian because they are more drier) many others are fried from which is Cibureki (the photo on the main page of Ukraine Travel), an ancient dish originating from Greece and is filled with meat, eaten hot because the taste comes from the liquid inside which dries up when cold. We have still to talk about salads, famous because they are eaten in the cafes, restaurants, self service which is presented in multitude and for all tastes. 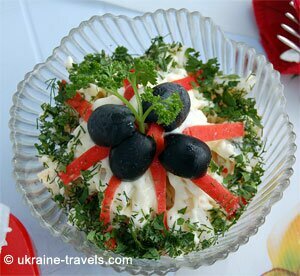 These salads resemble, in composition, to the well-known Russian salad but you will find dressed other than with the traditional mayonnaise but also with oil or sour cream but rigorously without vinegar because the culture of wine vinegar does not exist in the Ukraine. In short Ukrainian cuisine is worth knowing, flavours are particular but optimal, meat is also prepared well if normally pork or chicken, fish is optimal, bread is good, what else to say... try.